Guten Morgen Grammar: Simple Past my Ars…t | Guten Morgen Berlin! November 5, 2015 - Guten Morgen Berlin! One of my beloved regular readers requested a lesson on using the simple past in everyday conversation, so hold on to your jimjams because HERE WE GO. First things first: let’s decide on our terminology. Lots of people call this tense the ‘past historic’, presumably alluding to the ‘passé historique’ in French whose sole purpose is to create lingering acidic hatred in secondary schoolkids. I don’t really think this name is very helpful as it just sounds poncey and doesn’t enlighten us at all about what the tense is actually doing. Others call it the ‘imperfect past tense’, which is a terrible idea because this tense doesn’t suggest any ‘imperfect’ meaning, as we’ll see in a second. The other name for this tense is the ‘simple past’, and that’s my preferred nomenclature because it says it like it is: this is a form of the past tense which is simpler than the other form (“ich habe gesehen”) because it only uses one word rather than two (“ich sah”). Ich habe ihm meine Telefonnummer gegeben. Ich gab ihm meine Telefonnummer. Both of these sentences mean ‘I gave him my phone number’. There is no difference in meaning; they are the same sentence to all intents and purposes. The present perfect is formed with a present-tense form of ‘haben’ or ‘sein’ plus a past-participle, which is why we call it the ‘present perfect’ in the first place, while the simple past is just formed with one word which, in all its simple and unified glory, encapsulates the whole idea of past-ness by itself. The simple past is made by taking the root of the simple past form and jamming the endings on as per the image below. For regular verbs, finding the root is as easy as grabbing the infinitive (e.g. 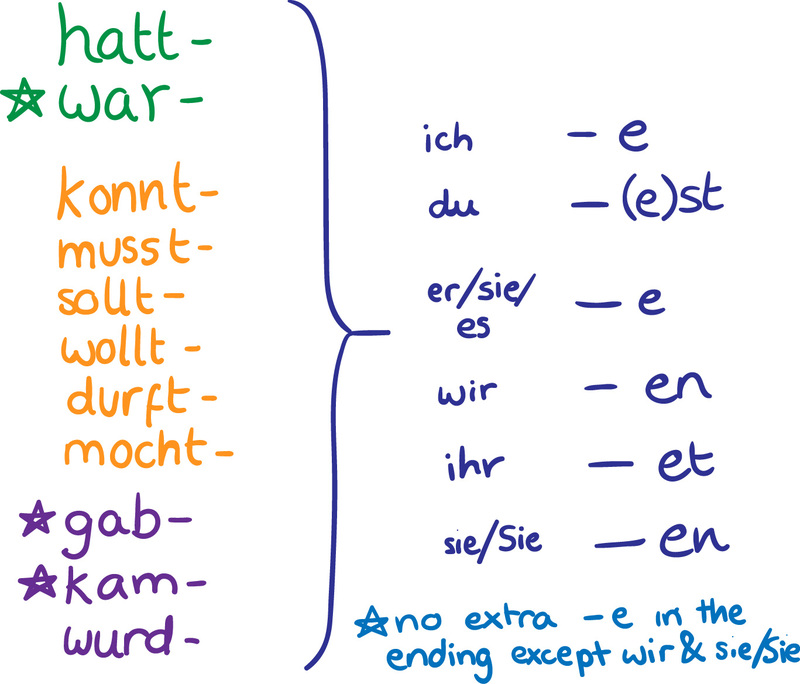 “kaufen”), removing the “-en” and adding on a “-t” (e.g. “kauft-“) followed by the ending. Sadly, the irregular verbs tend to change their main vowel in the simple past, so those have to be memorised. Here’s a useful and full list of the irregular verbs with their simple past roots. Er wollte mit uns meinen Geburtstag feiern. Alle kamen viel zu spät zum Restaurant. Es gab Kuchen, Sekt und Schnitzel. Some of the irregular verbs drop the -e for every ending apart from the -en endings; this is something you should try to remember as you memorise the irregular verbs. No need to learn all of them off by heart, though; lots of them are very esoteric, so I recommend you just learn the ones above plus fifteen or so of the ones you think seem most useful, at least for starters. Write ’em on a card, keep it in your wallet, chant them while waiting for the bus, terrify passers-by; it’s a win-win. The other thing which separates the present perfect from the simple past is how you use them. You see – and this is where you might start to get that familiar grammar-induced migraine coming on – the simple past is usually only used in written German, for example newspapers or novels, while the present perfect is almost always used in everyday speech. “Why? ?” you might ask, as you kneel on the floor weeping at the mercilessness of German complexity. Well, the main reason is actually for the sake of easiness. Although the simple past is nice and neat in its one-word compactness, it tends to be mad and irregular and needs a different ending depending on who is doing the action. With the present perfect, all you need to remember is the past participle, and then you’re set for life as long as you know your habens and seins (which you really ought to, seriously dude I mean come on). BUT – and, like my own, it is a big but – we do sometimes use the simple past in everyday speech if it helps to make life easier for us. Let’s look at when that happens. Ich war begeistert über seine neue Frisur. Wir hatten keine Zeit, das Zelt einzupacken. Ich bin über seine neue Frisur begeistert gewesen. 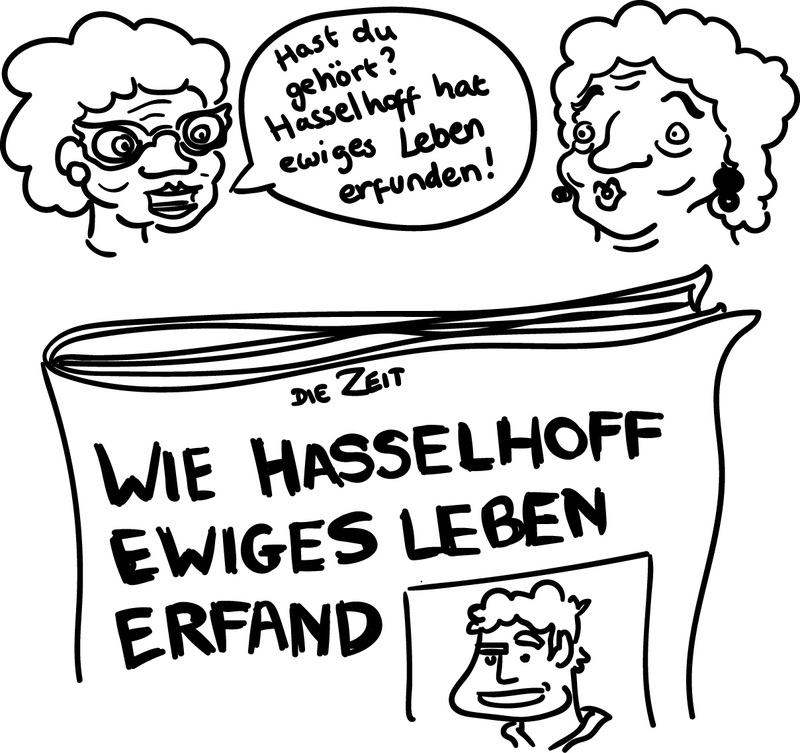 Wir haben keine Zeit gehabt, das Zelt einzupacken. For that reason, generally we use the simple past tense forms of haben and sein when talking in the past tense in spoken German. The modal verbs (können, müssen, sollen, wollen, dürfen, mögen) kindof lost their past participles a long time ago simply because they sound so goofy (‘ich habe gekonnt’? No thank you), similar to in the English – you wouldn’t say ‘I have coulded’, and ‘I have canned’ means something entirely different. Added to that is the fact that modals always work with a second, infinitive verb, so if you were to use the present perfect you’d have three verby bits in the sentence and things would start to get messy and unpleasant. So let’s use the simple past. K? K.
So what’s the point of learning the simple past if it’s not used very often? Well, for starters everyone should learn the simple past of haben, sein and the modals for spoken German as an absolute bare minimum, as I explained above. They’re helpful for everyday conversation and you’ll be glad to have them once you start sending verbs to the ends of clauses and all kinds of extravagant German grammatical chicanery. It’s important to be able to understand and recognise the simple past because it is used widely in written German, both fiction and non-. 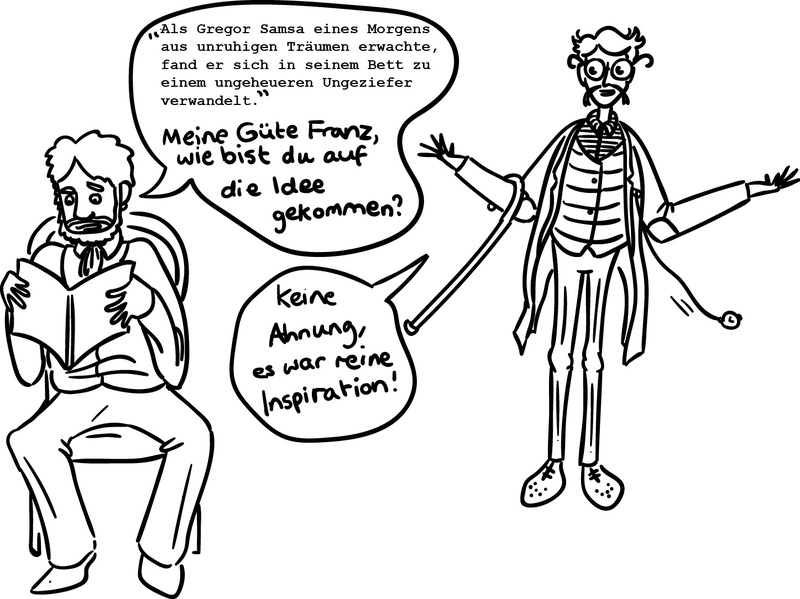 Take a look at that cartoon at the start of this lesson; that sentence is the first line from Kafka’s Metamorphosis, and it contains a regular and an irregular simple past verb. Can you figure out which one is which? And which of the other verbs in the conversation are present perfect or simple past? And can you identify why that is the case, in each example? Another reason why it’s so useful to feel comfortable with the concept of the simple past is that it helps us to deal with the pluperfect and the conditional tenses when we move on to some more advanced German. We’ll have lessons on both of those in the future. Flick through the irregular simple past verbs from time to time until you can guess their meaning on sight. It’s a useful little skill which helps you to enjoy reading German books and journalism much more. A good way to remember those irregular verbs, including their past participle and present forms, is to make a spider diagram where each branch represents a common vowel change pattern (for example, ‘i – i – a – u’) and then clustering all the verbs which follow that pattern around the node for that branch (‘finden, findet, fand, gefunden / binden, bindet, band, gebunden’). Use nice colours and stick it up somewhere where visitors will be impressed at your proactive learning style when they come round for a beer. That’s yer homework. Now get out of my classroom, you little ratbags.